pieofthebeholder | 52 weeks. 52 pies. It must be that time of year again. The holidays are around the corner and we’re getting close to another turn around the sun. Pie time. 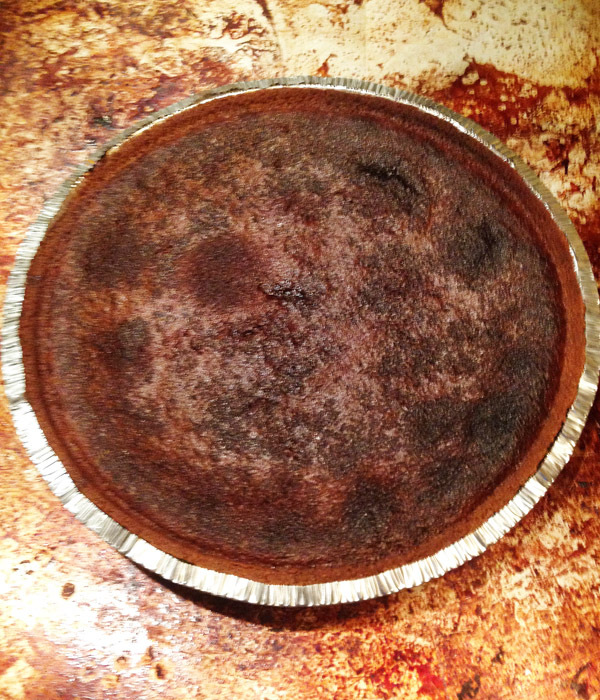 Recently, I was at a small gathering of friends in downtown Austin and the subject of pie came up. Someone asked if I’d ever baked an apple pie with a cheddar cheese crust. I’d never heard of it. It sounds like a weird pairing but I was assured it’s quite good. So, because I hadn’t made a pie in a while, and with Thanksgiving coming up, I thought I’d give it a whirl and share it here. Most of this recipe is from Nancy Fuller, host of the Food Network show Farmhouse Rules. I made some minor edits based on item availability and some measuring goof-ups. Combine the Granny Smith apples, Gala apples, sugar, flour, light brown sugar, cinnamon and nutmeg in a large bowl and toss to combine. Roll out 1 disc of the dough on a lightly floured surface to a 12-inch round. Transfer to a 9-inch pie dish. Add the apples in an even layer. Mine looked like a mound of sliced healthy goodness, with sugar. Lightly brush the edges of the crust with egg wash. Next, roll out the second dough round, slightly larger than the first. 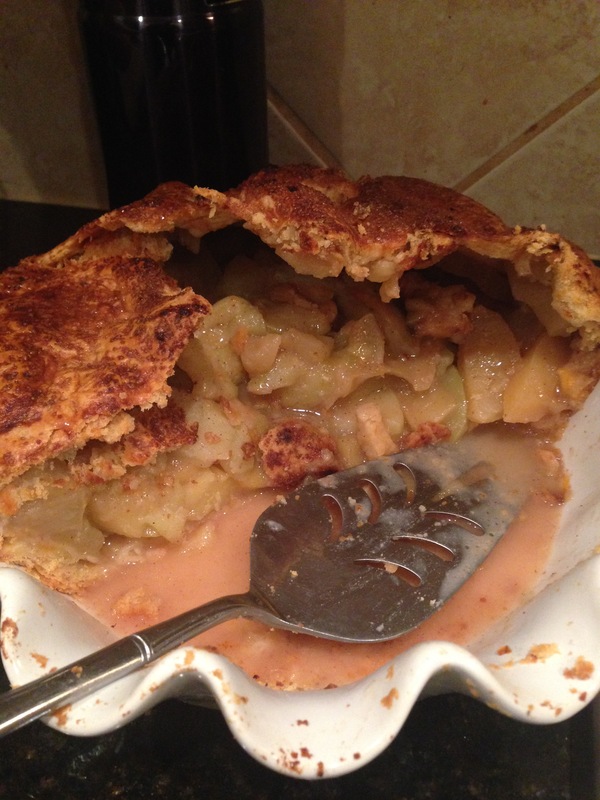 Cover the top of the apples with the second pie dough, pressing the edges to seal the crust. Trim the crust. Crimp the edges. 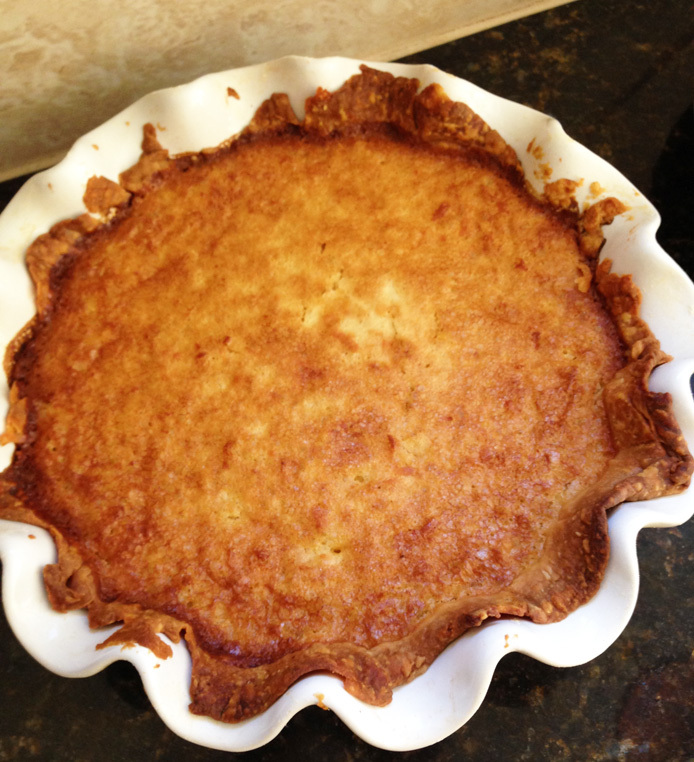 Brush the pie with the egg wash and sprinkle with the brown sugar. Make 4-5 air slits in the center of the pie and place the pats of butter in the slits. Place the pie on baking sheet and bake for 25 minutes. Lower the oven temperature to 350 degrees F and bake for 45 minutes longer. Cool to room temperature, at least 3 hours before tearing into it with your excited family or friends. Or even yourself. 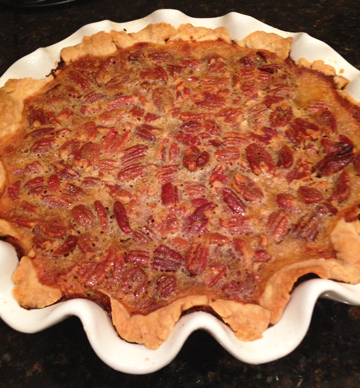 Just in time for the holidays, I present to you the Pecan Pumpkin Pie. This is a pie for those who want to bake something for their holiday dinner and can’t decide which one to concoct. And this is also a pie for those of you that can’t decide which slice you want for dessert. 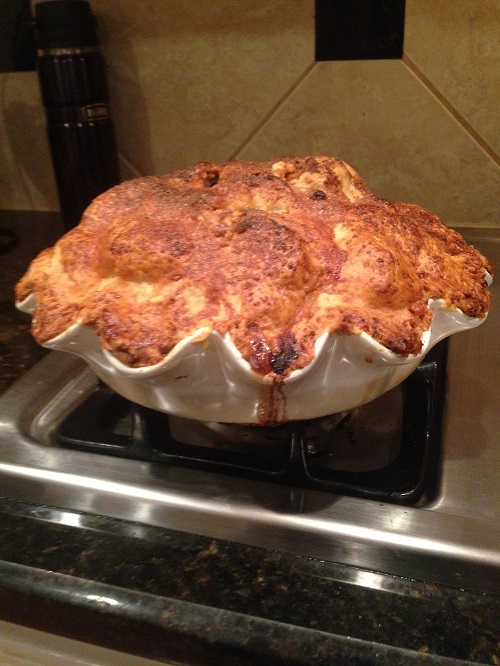 This tasty pie comes courtesy of The Gourmet Cookbook, edited for the maximum delicious by Ruth Reichl. Blend together flour, butter, and salt in a bowl with your fingertips, or pastry blender (or do what I did and pulse in a food processor) until mixture resembles a course meal with pea-size lumps of butter. Evenly add 3 tablespoons of ice water in mix and mix (or pulse) until combined. Squeeze a small handful of dough: if it doesn’t hold together add ice water a half tablespoon at a time, mixing or pulsing until incorporated. Don’t overwork the dough or pastry can become tough, which is great for street fighting but not pie making. While you’re waiting for the dough to firm up, make your fillings. In a large bowl, mix all ingredients until smooth. Set aside. In a large bowl, mix corn syrup, brown sugar, eggs, butter, vanilla , zest, and lemon juice until well combined. Stir in pecans. Set aside. Place oven rack in center position. Pre-heat your oven to 375F. It’ll take about 8 minutes to heat up. that will provide you the time to get your pie shell ready. Roll out your dough on a lightly floured surface, using a rolling-pin to make a 13 inch circle. Transfer to a 9 inch pie plate and trim excess to leave a 1/2 inch overhang. fold it under and crimp the edge as desired. Lightly poke the crust in several places along bottom with a fork and refrigerate for 30 minutes if desired (I didn’t put it in the fridge). Line with foil and place pie weights, rice or dried beans onto foil. Place on center rack and bake for 20 minutes. carefully remove foil and weights and bake pie shell until lightly golden, 6-10 minutes more. Remove from oven (leave oven on) and allow shell to cool. Once shell is cool, evenly spread pumpkin filling over bottom of shell. Carefully spoon pecan filling over pumpkin layer. Bake the pie until crust is golden and filling is puffed, about 35 minutes (center should still be slightly jiggly). Cool completely on a rack. It’s the first day of spring:) The weather is getting warmer in Austin (it was 76F today) and it’s almost time to go out and clear the dead crap from the yard. That’s something for the weekend if it doesn’t rain, but for today there was a need for pie. Problem is I’m feeling lazy and didn’t want to create something from scratch. So I grabbed a few things from the fridge and the cupboard and made a lazy man’s cherry pie. 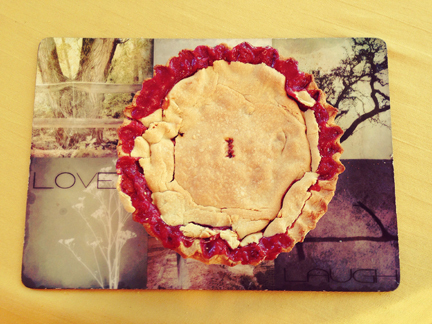 You can never go wrong with cherry pie, especially on the first lazy day of spring. Pre-heat oven to 425F. Pull pie shells from freezer and let thaw for 15 minutes. Separate one from the tin and roll it flat on a floured cutting board. You know, so it doesn’t stick. Set the milk aside to bind the top shell to the bottom shell when it’s time to bake. In a medium sauce pan, combine the sugar and cornstarch. Add the water and mix until smooth. Stir over medium heat until mixture is thick and it bubbles. Continue to stir for an additional minute. Remove from heat and add cherries and butter. Combine and pour into your pie crust. 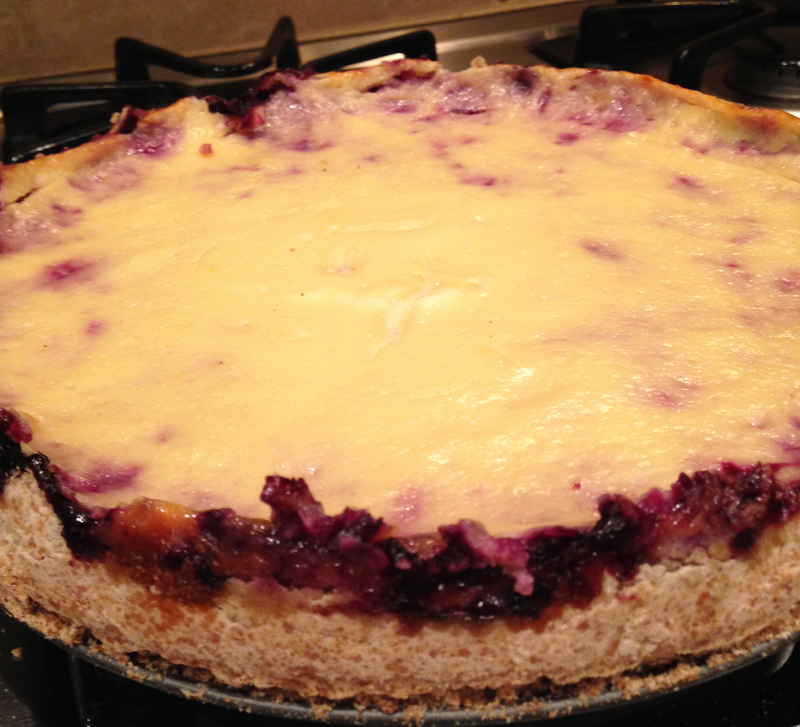 Brush the edge of the bottom crust with milk and place your cutting-board pie crust on top. Flute the crust and cut a slit in middle to vent. Bake at 425F for 10 minutes. 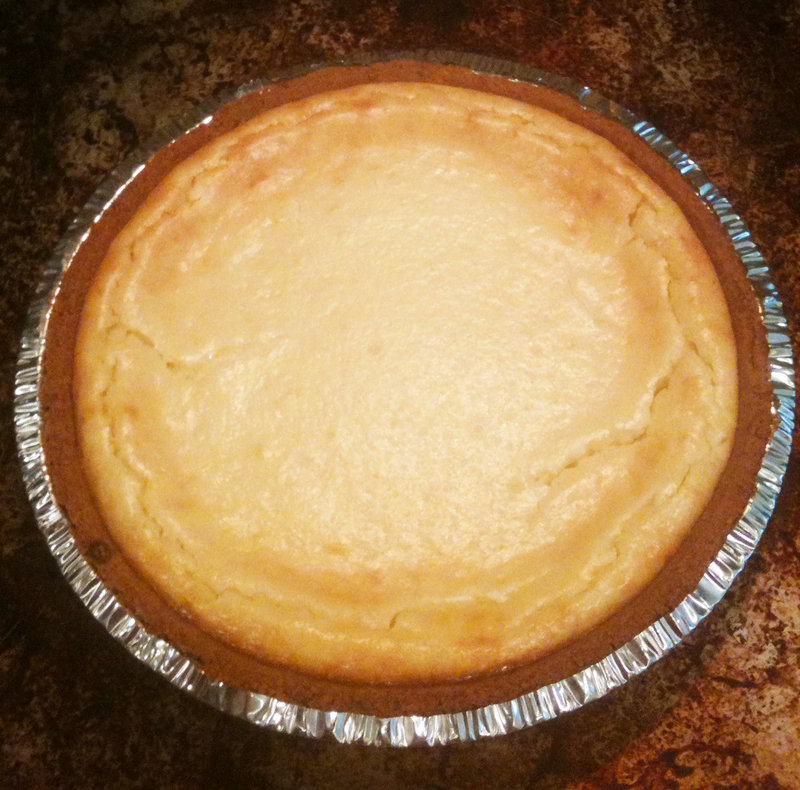 Reduce temperature to 350F and bake an additional 25-35 minutes or until the top crust is a golden brown. Remove from oven and let cool for a couple of hours. Dig in. My vent didn’t work too well as you can see. But the pie was pretty tasty and not too sweet. I would recommend adding some whipped cream or vanilla ice cream to add to it. If you’re anything like me, I hope that spring is a way better time in 2014 than winter. I think it’s time to look for a few other recipes to try out. We have center vent fail.